Reisen in Irland können schwierig sein, ohne ein Auto zu mieten. 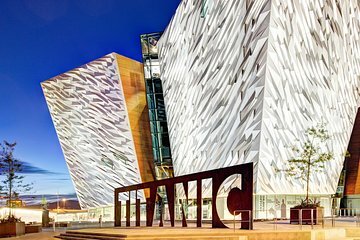 Fahren Sie von Dublin mit dieser Titanic Belfast und Giant´s Causeway-Tour, die den Hin- und Rücktransport in einem klimatisierten Reisebus beinhaltet, ganz bequem nach Dublin. Neben Haltestellen am Giant Causeway und den Dark Hedges gibt es auch Freizeit auf der Titanic Belfast und in der Stadt. I really liked this tour because you get to see many different places in one day for an absolutely fair price. We saw the Giant's Causeway, the Dark Hedges and the Titanic Experience. Before we went to the Museum, we had about an hour to explore Belfast, which was very nice. Our tourguide Derrick was also really nice and gave us a lot of interesting information and the driver Peter was a very safe driver. When you visit so many different places in one day you obviously cannot spent several hours at each location but in my opinion the tour was very well organised so that we still had enough time at each place. I wish spend more time in Belfast instead of remaining 2 hours at Giant's Causeway. Also the time for Titanic Museum was too much. Captain John was our tour guide - very knowledgeable, great sense of humor and a safe driver! We spent enough time in each of the locations! Would definitely recommend this trip! Gavin and Mark were the best tour guides! What a fun and smooth day trip! I highly recommend spending the day on this tour...so worth it from start to finish. My only regret is running out of cash to tip these amazing gentleman! It was an amazing trip..the driver was very entertaining and very informative. This trip was amazing. I would recommend this tour to anyone that's visiting Ireland. Have fun and enjoy! An amazing trip it was, with Derrick and Mark. Derrick is a perfect guide, and musician as well. He kept us interested all the time. We had grand weather, the Giant Causeway was amazing. Also the Titanic experience was wortal seeing. This is an excellent day trip to Northern Ireland, Belfast, with highlight visit to the Titanic Museum. The Museum is very interesting and features many interactive and exhibits of the building of the Titanic and its fatal voyage. There are many features about the ship and the crew and passengers that sailed on its voyage. There is also a feature about how the wreckage was found and pictures of the wreckage on the ocean floor. Following this visit the tour goes to the Giants Causeway which is interesting natural feature created by volcano on the coast. The hexagonal rock shapes are exceptional to see and the legend of the giants is very interesting as well. There is a shuttle bus that can take you down to the rock formation and bring you back. It is worth the 1 pound return ticket on a windy and rainy day. One good hint is that after you visit and have some time go to the Causeway Hotel and have a nice seafood chowder lunch with glass of wine. My wife and I enjoyed the atmosphere in the hotel. From here you go to the Dark Hedges which takes you through some beautiful countryside as well. The hedges are actually a long row of beech trees that are about 250 years old and have survived much longer than expected. However, they are beginning to die and according to our guide should all be gone within the next 20 years so you should hurry to see them. The drive back to Dublin is a bit long, but there is one rest stop to grab a drink and some food before arriving back to Dublin. The tour guide, Chris, was very good and had some interesting stores to tell of Irish history and the legends related to this history. Peter was the driver and was excellent and safe driver. Both made for interesting day trip that is highly recommended. Quite possibly the best tour I've been on! Ierin I apologize, I think I may have spelled that incorrect was an incredible guide. Not only was he polite as could be, he had a wonderful sense of humour and ensured each guest was taken care of. He shared interesting stories along the way which made the driving portion of the tour go by quickly, and was extremely knowledgable. The tour itself was set up well in terms of having more than enough time at each location - it was well organized, bus was clean and comfortable and just an amazing day!